Enough options to satisfy both the herbivores and the carnivores in your family! 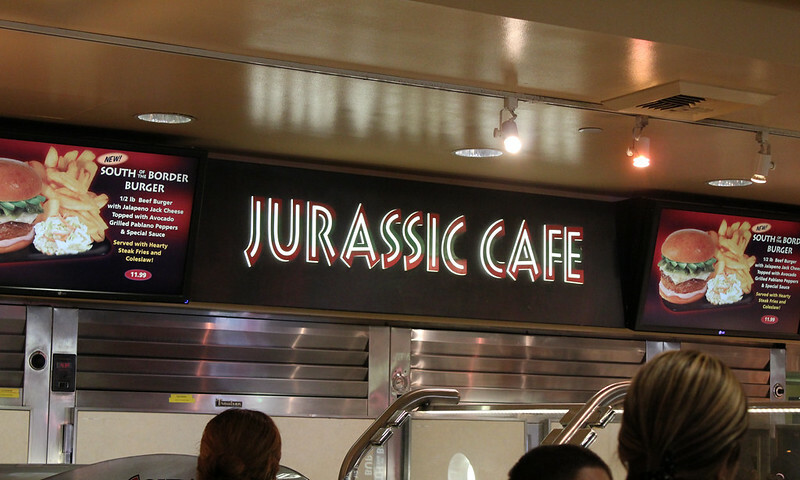 Jurassic Café is quite literally a catch-all for a variety of different foods! This wildly popular restaurant serves the dining needs of the Lower Lot. Jurassic Park is located directly to the right of Jurassic Park: The Ride. Noted as the “Chef’s Choice,” this ½ pound premium burger is certain to satisfy. Each burger is served with a side of fries and homemade cole slaw. You can add bacon to your burger for just $0.99 more! Guests have the choice between a four cheese or pepperoni pizza. Each personal pizza is cut with four slices! If you think you might still be hungry, you can add a Caesar Side Salad for only $0.99! Unlike most entrees served here, the Citrus Marinated Roasted Chicken Dinner gives you the most bang for your buck with sides of mashed potatoes and gravy, a biscuit, and buttered corn. The Turkey Leg Plate comes with a side of fries and their signature cole slaw. The chicken tenders and grilled chicken sandwich, however, are served on their own with no sides included. 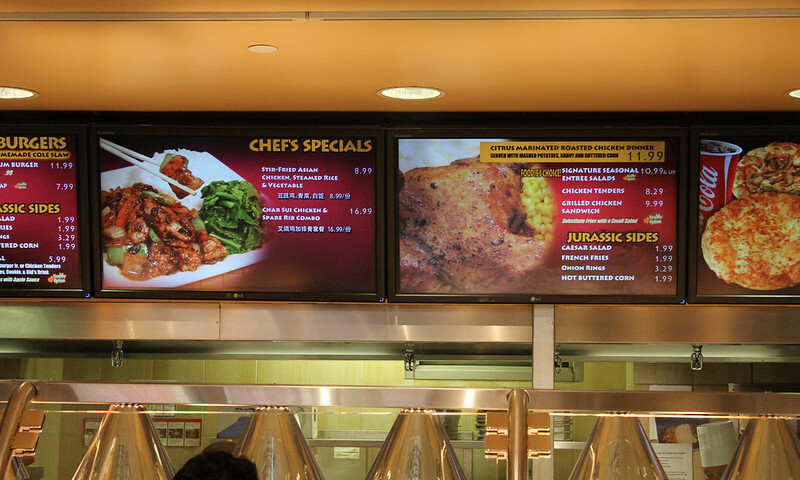 Jurassic Café features a variety of different full-sized seasonal salad entrees as well as a vegetarian wrap. The salads vary depending on the season, so be sure to keep your eye out for your favorites! Insider tip: You can substitute any side of fries for a small salad instead. Your choice of a Grilled Cheeseburger Jr. or Chicken Tenders. Each meal is served with Apple Sauce, mini Graham Cookies, and a Kid’s drink! Caesar Salad, French Fries, Onion Rings, Hot Buttered Corn. Coca Cola brand fountain drinks are available in 22 oz. and 32 oz. sizes, or can be purchased with a Souvenir Sipper, which features one free refill and $0.99 refills for the rest of your day! Other refreshments include Powerade, bottled water, Starbucks coffee, Tazo tea, hot chocolate, domestic and imported beer. 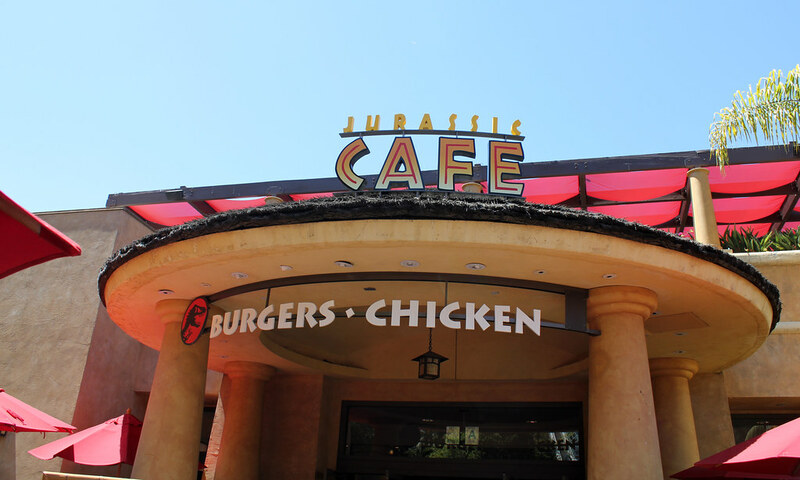 If you find yourself looking for a meal, but you aren’t ready to make the trek to the Upper Lot quite yet, Jurassic Café is the place to go! With such a large and diverse menu, this restaurant is certain to please everyone in your family. Since this is one of only two full-dining establishments on the Lower Lot, this restaurant tends to get very crowded. And while the wide variety of choices is very convenient, it also leads to a long line of people trying to make a decision. We recommend visiting this location either slightly before or slightly after typical meal times to help avoid crowds. It is also important to at least have an idea of what you want to eat in order to help speed up the process. 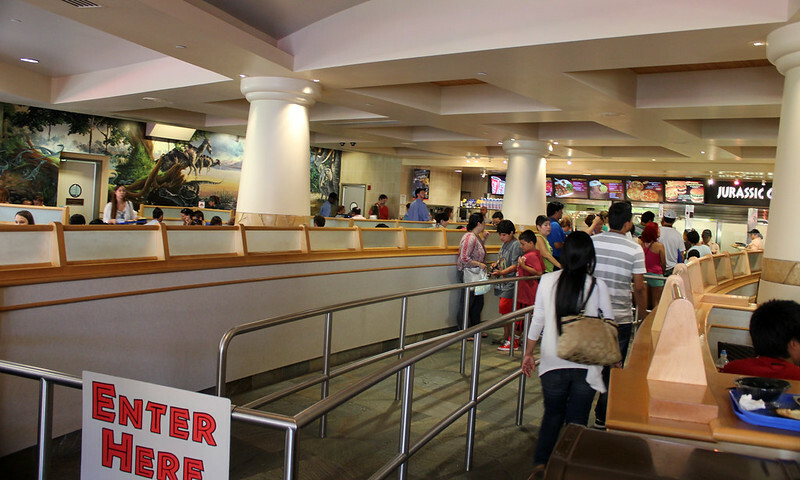 While there is seating located inside the restaurant, this area tends to fill up quickly, especially on peak attendance days. But don’t give up yet! There is often plenty of outdoor seating both right outside the restaurant and upstairs above the restaurant. To get to the upstairs dining location, you can climb the stair case that many guests stand on to watch the big drop from Jurassic Park: The Ride! Many people don’t know about this area, so it is almost always empty. This dining location is a great way to escape the crowds for a bit and enjoy your meal in peace.